Slender’s Woods is a new take on the “Slender” mythos. From what I have gathered Slender is sort of a new cult, horror figure, dreamed up on a forum and first given his big break in the game of the same name. There have been variations on this game, but the main premise is that, in the dark of night, with only a flashlight and no companions, the game-player must traverse a wooded landscape, and through buildings with only a flashlight, discovering pages/notes as this strangely elongated, suit-wearing figure with no face suddenly pops into view and gives chase. If he catches you, game over. Slender’s Woods look to expand on some of the basic gameplay elements by adding in some simple story to the notes and having the player collect keys and door codes. With each pickup the danger grows nearer until the titular villain starts popping into view and scaring the crap out of the player. Just head to Youtube for tons of videos of frightened players screaming. 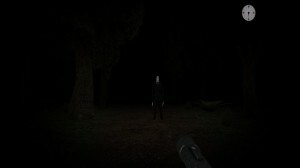 Slender is a simple premise that delivers big on scares. It is a game based nearly solely on light (or lack there of), tone and atmosphere with the two latter attributes of Slender’s Woods greatly enhanced by the musical score. Perhaps the most standout track of Aspetic Void’s Slender’s Woods soundtrack is the piece entitled Lullaby. An excerpt of Lullaby is the first music we hear upon starting the game. It sets the tone with a classic implementation of horror music. Composers have often taken a light-hearted instrument, usually associated with children, such as a cymbal, toy piano or bell, and played a simple melody against harsh or ominous tones. Just think back to the music of Halloween apart from the main theme, simple drawn-out synth chords enhanced with single piano notes. The structure of this track sticks to the idea of using dissonance; creating a mood and atmosphere that is slightly off and therefore also slightly ominous. While Lullaby features a melody, the majority of the tracks are there to create atmosphere primarily through tones and soundscapes. This is fitting as Aseptic Void (David T.) describes his focuses as Dark Ambient, Experimental and Soundscape music. Many of the tracks, such A Silent Place, are simply these dark soundscapes that are enhanced by creepy sound effects lightly peppered throughout: the occasional breath, a ringing tone or the like. They give off a mechanical/industrial feel. While tracks like this remain fairly calm, even monotone in their brooding, a track like Arrival goes much further in building tension. Arrival slowly gains in pace and volume until the track is esentially screaming at you. If horror music is your kind of thing, give the Slender’s Woods soundtrack a try. I know that when I write in a particular style or on a specific theme, I like to have instrumental music in the background. I could see myself potentially using these tracks for that use with horror themes. Check out Aseptic Void’s soundtrack on Bandcamp and Slender’s Woods on Desura below.